"Want That Old World Look? 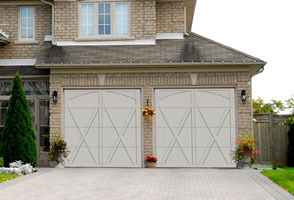 Modern steel garage doors offer the beauty and charm of the Old World Carriage House Era without the maintenance and fuss associated with wood garage doors of the same styling. They open overhead, yet can appear from the street-scape to be hinged to swing out giving your home that rustic and romantic architectural appearance of yesteryear. They feature an assortment of window styles and main panel designs so you can customize them to give your home that one-of-a-kind look and feel. The photo at the left shows steel doors manufactured by Overhead Door from their Courtyard Collection 167T Series. They feature a wood-grain appearance with x-bracing to give them that swing-out appearance. The 167T Series comes with a limited lifetime warranty for as long as you own your home. They can be fitted for heavy wind-loading requirements to meet the building code of your local jurisdiction. They are available is seven (7) gorgeous colors and can be fitted with a variety of glass types including tempered glass, clear Lexan®, solar bronze glass, as well as obscure glass and Bevelite® decorative acrylic lenses. The photo at the left depicts steel garage doors manufactured by Overhead Door from their Courtyard Collection 377T Series. They feature a segmented arch design at their top panel with x-bracing to give them that swing-out appearance. The segmented arch panels at the top can be fitted with a window design inside the arch for that Old World look. This door series can have insulation in the entire door panel area with an R-value of up to 9.31. 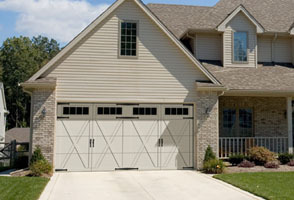 They are a high-value, functional and beautiful replacement door for your home. The 377T Series comes with a twenty (20) year limited warranty and a limited lifetime warranty for as long as you own your home. They are available in the pre-finished colors of White, Almond, Sandstone, Terra, Bronze, Brown and Hunter Green and can be fitted with all of the same window patterns, glass types, and exterior hardware as the 167T Series mentioned above.